Meet the mother who breastfed twins, who struggled with infertility, who had an unexpected c-section, who survived postpartum depression. Meet the mother who is still trying to love her body after having her babies. Photographer Jade Beall celebrates all of these moms, and many more, in her new book The Bodies of Mothers. 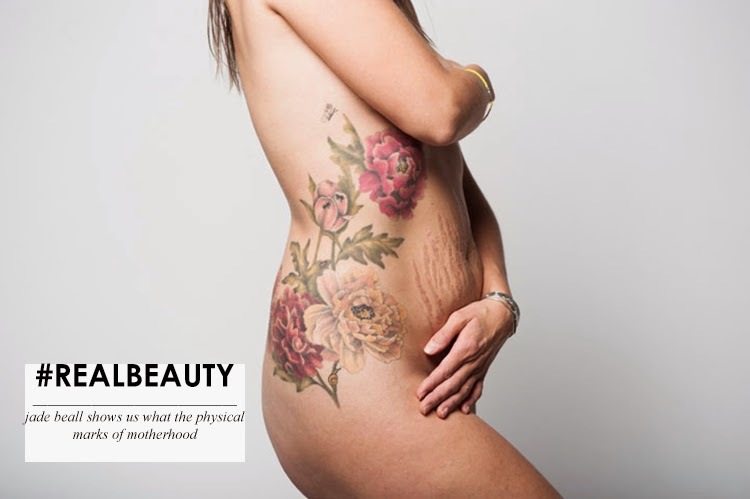 Eighty women in total bare their post-baby bodies – stretch marks, squishy bellies and all – within its pages in a brave and honest testament to the true beauty of motherhood. Here is a look at some of her stunning portraits. Do you recognize yourself in any of them? Jade's photographs have been the catalyst for comments echoed by thousands more mothers around the world, many of whom confessed that they, struggle with the physical marks that motherhood has left on them. They, too, are so profoundly grateful for their children yet can’t embrace the bodies that grew and delivered them. She’s right, being a mother is hard enough. It’s sad to know that so many women – women who carried, birthed and nurtured our babies, who are trying so hard to be good, present, caring mothers – still feel like we don’t quite measure up. Becoming a mom has helped me to see my body with more forgiving eyes, but when I look in the mirror long enough to focus on the so-called flaws, I realise I haven’t untangled myself from the web of body image issues just yet. I hope that as my daughter grows up she will always feel, in her core and at her roots, that she is enough exactly as she is. I hope every mother can feel that, too. After all, as Jade’s photos show, true beauty lives in all of us.